The Ford Escape is a compact crossover SUV sold by the automaker Ford Motor Company introduced in 2000 as a 2001 model year and priced below the Ford Explorer. The Escape was sold in Europe as the Ford Maverick. It was jointly developed with Mazda, in which Ford owned a controlling interest, and was released simultaneously with the Mazda Tribute. In the United States, Ford's Mercury division released a luxury version called the Mariner starting with the 2005 model year. 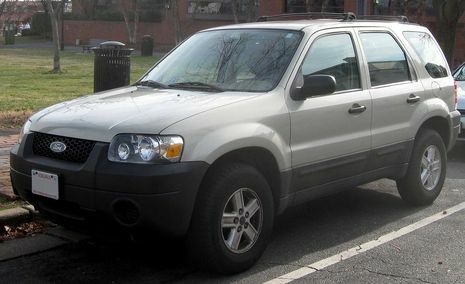 The first generation Ford Escape was released in North America for the 2001 model year. It was slotted below the larger truck based Explorer in Ford's lineup, but was larger than the small SUV offerings from Honda and Toyota. At the time, most sport utility vehicles used a truck based Body-on-frame design. Solid rear axles were commonly used due to their ability to carry heavy loads at the expense of a comfortable ride and good handling. Ford realized that most SUV owners did not take their vehicles off road, and decided instead to use a car-like Monocoque design with a fully independent suspension and rack and pinion steering for the Escape. Although not meant for serious off-roading, a full time all wheel drive system supplied by Dana was optional which included a locking center differential activated by a switch on the dashboard.The all wheel drive system normally sends most of the power from the engine to the front wheels. If slipping is detected at the front, more power will be sent to the rear wheels in a fraction of a second. The entire braking system was built by Continental Teves including the ABS and various related suspension components.hh CKD production began in 2002 at Ford Lio Ho Motor Co. in Taiwan for various Asian markets. Crash test results for the Escape have been mixed. In the New Car Assessment Program administered by the USA based National Highway Traffic Safety Administration, the car received 5 out of 5 stars for driver protection and 4 out of 5 stars for passenger protection in a 35 mph (56 km/h) frontal impact. The SUV received 5 stars for both driver and rear passenger in the side impact test. In the Insurance Institute for Highway Safety's 40 mph (64 km/h) frontal offset test, 2001-2004 Escapes received a score of "Marginal".In the side impact crash test vehicles equipped with the optional side air bags received a score of "Good" in the 31 mph (50 km/h), while those without the optional air bags received a score of "Poor". All Escapes are equipped with a passive Immobiliser called SecuriLock. This feature includes a RFID chip embedded in the key which is read by the car each time the vehicle is started. If the vehicle fails to receive a valid confirmation signal from the key, the vehicle will not run even if the key is perfectly cut to match the original. Theft, Injury, and Collision losses reported to insurance companies for the Escape are among the lowest in its class. Electronic Stability Control was unavailable on all models. The Escape is built on the Ford CD2 platform, which is in turn based on the Mazda GF platform, which was used by the Mazda 626.
ince its introduction, the Ford Escape has been one of America's best-selling small SUVs. Considering how many other vehicles are available in this segment (many of them well established before the Escape's debut), this may come as a bit of a surprise. But Ford has a keen knack for designing SUVs that appeal to a wide range of buyers. With the Escape, Ford successfully combined the styling and four-wheel-drive capability of a traditional SUV with the size, practicality and driving characteristics of a midsize car. For the urban dweller in need of something comfortable, versatile, fun to drive and capable of doing some light-duty off-roading or towing, it fit the bill perfectly. Of course, the Escape's low price certainly boosted its appeal as well. Though these attributes still hold true today, there's no denying that the Ford Escape's basic design is getting a bit old, even with a significant freshening for 2008. The interior in particular has received significant improvements, with much better materials and a more attractive design. Regardless, the Escape is at a disadvantage against newer compact sport-utilities, which are more refined and offer more rewarding driving experiences. The Ford Escape is a compact four-door SUV. Due to its light-duty four-wheel-drive system, fully independent suspension and unibody construction, it's more suited for on-road driving than off-roading. Its underlying structure was developed with input from Mazda, whose Tribute is very similar to the Escape. The Mercury Mariner is also nearly identical to the Escape and differs mainly by having a few more features and different interior and exterior design details. The Escape is available in one four-door body style with either front-wheel drive or all-wheel drive. Three trim levels are offered: XLS, XLT and Limited. As with other Ford products, moving up the list provides additional standard features. The majority of shoppers will likely be satisfied with the XLT. All trim levels can be had with either front- or all-wheel drive. All but the Limited come standard with a 2.5-liter four-cylinder engine that produces 171 horsepower. A five-speed manual transmission (XLS only) or a six-speed automatic are available. Standard on the Limited and optional on the XLT is a 240-hp 3.0-liter V6. The six-speed auto is the lone transmission with the V6. A special version of the Escape, the Escape Hybrid, has a gasoline/electric powertrain that provides the best fuel efficiency of any SUV. The current crop of engines handily addresses previous complaints of merely adequate acceleration and mediocre fuel economy. Despite a supbar braking performance, Ford's latest Escape is worth a look. 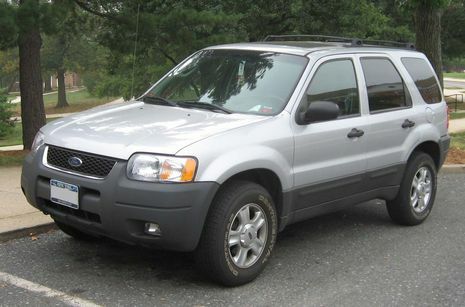 The Ford Escape was introduced in 2001, and its basic exterior and interior design remained unchanged until a major refresh for 2008. It was available in XLS, XLT, XLT Sport and Limited trim levels. For five years in a row starting with its debut year, this Escape was either a winner or a runner-up in our Editors' Most Wanted SM awards for either a compact SUV or an SUV under $25,000. Considering how many of these Escapes were sold, shoppers should have plenty of opportunities to be choosy and find a used model that suits them. First-year Escapes were tarnished by numerous recall notices. Though likely resolved at this point, going with a 2002 or newer model might be a good idea. The Limited trim, with its leather-appointed interior, first appeared for the 2003 model year. Potential buyers of this first generation of Escape should note that its interior materials were of poor quality, with cheap, hard plastics everywhere. From 2001-'04, Ford Escapes were equipped with a rather anemic base engine. This 2.0-liter four-cylinder made 130 hp and is generally considered underpowered. It was replaced by a 2.3-liter inline four-cylinder engine that made 153 hp. Ford offered this engine from 2005-'08. From 2001-'07, the optional V6 produced only 200 hp and was coupled to a four-speed automatic. 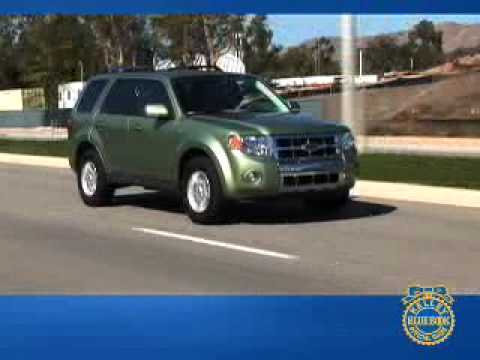 Ford Escape is a mid-size car-based comfortable and functional SUV. 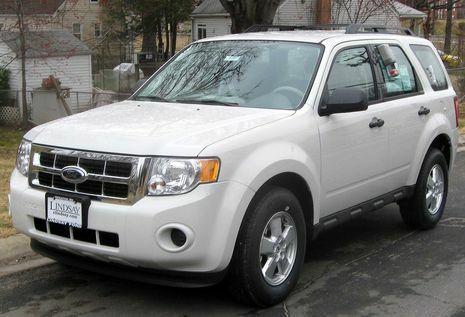 Ford Escape was developed in association with Mazda; Mazda Tribute is built on the same platform. Ford Escape was the America's best-selling small SUV for a few years. Hybrid version is available from 2005. The Escape has car-like unibody construction with fully independent suspension and comes as a front- or four-wheel drive. The drivetrain choices include transversely-mounted 4-cylinder or V6 engine and 5-speed manual or 4-speed automatic transmission with overdrive. ABS is optional (standard from 2006). The Escape has disk brakes in front and drums in the back (all four disk brakes are available on late V6 4WD models). The interior is comfortable and roomy, but conservatively-styled and some materials lack refinment. Tall driving position offers good visibility. The split rear seat can be easily folded flat (with headrests removed) for extra cargo room. The Escape offers comfortable ride and good handling for an SUV. Some engine and wind noise are noticeable, especially at highway speed. Optional four-wheel drive system provides good traction on a slippery road, although it's not designed for heavy off-roading. In the NHTSA frontal crash tests, the 2001-2004 Ford Escape received five stars for the driver and four stars for the front passenger. The 2004-2007 Ford Escape received four stars for both the driver and the front passenger.